Habit: Perennial herb from caudex or rhizome, generally +- hairy. Stem: often +- leafy on proximal 1/2, rarely trailing and leafy throughout. Leaf: generally simple, basal and/or cauline, generally alternate, generally petioled; veins +- palmate. Inflorescence: raceme or panicle, generally +- scapose. Flower: generally bisexual, generally radial; hypanthium free to +- fused to ovary; calyx lobes generally 5; petals generally 5, free, generally clawed, generally white; stamens 3, , 5, 8, or 10; pistils 1 (carpels +- fused, ovary lobed, chambers 1 or 2, placentas generally 2(3), axile or parietal or occasionally proximally axile and distally marginal in ovary lobes) or 2 (carpels free, placentas marginal), ovary nearly superior to inferior, occasionally more superior in fruit, styles generally 2(3). Fruit: capsule (generally 2(3)-beaked, valves generally 2(3), generally equal) or 2 follicles. Seed: generally many, small. Genera In Family: +- 30 genera, 600 species: especially northern temperate, arctic, alpine; some cultivated (Bergenia, Darmera, Heuchera, Saxifraga, Tellima, Tolmiea). Note: California Mitella moved to Mitellastra, Ozomelis, Pectiantia; Suksdorfia ranunculifolia to Hemieva. Parnassia moved to Parnassiaceae. Scientific Editor: Bruce G. Baldwin. Habit: Rhizome slender, scaleless, bearing bulblets. Leaf: basal and cauline, reduced distally on stem, generally alternate, increasingly more deeply lobed from younger basal to distal cauline; blade round, base cordate to reniform, +- lobed, generally toothed. Inflorescence: raceme; bracts scale-like or 0. Flower: hypanthium generally partly fused to ovary; petals generally lobed or toothed; stamens 10; pistil 1, ovary superior to +- inferior, chamber 1, placentas 3, parietal, styles 3. Fruit: capsule, 3-beaked, valves 3. Unabridged Note: Generic names ending in -phragma are considered of neuter, not feminine, gender. Habit: Plant 10--60 cm. Leaf: basal blade +- 3--5-lobed, teeth +- sharp-tipped. Inflorescence: flowers 3--15; pedicel 3--10 mm. Flower: hypanthium obconic, +- inflated above, part fused to ovary +- = free part; petals 5--13 mm, ovate-elliptic, 3-lobed at tip, white; ovary > 1/2-inferior. Seed: smooth. Chromosomes: 2n=14,21,28,35. Ecology: Open, grassy slopes; Elevation: < 2000 m. Bioregional Distribution: KR, NCoRO, NCoRI, c SN, ScV (Sutter Buttes), n SnJV (Antioch), n CCo, SnFrB, SCoR, SCo (inland), s ChI, TR, PR; Distribution Outside California: southwestern Oregon, Baja California. Flowering Time: Mar--Apr Note: Variable. Many forms, especially inland and in southern California, approaching and intergrading with Lithophragma parviflorum. 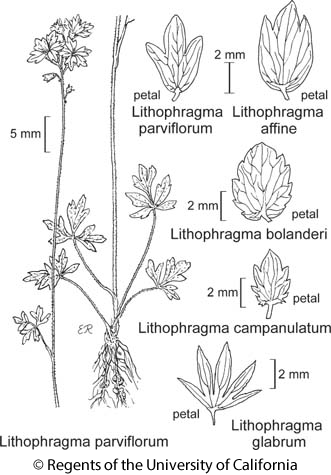 Citation for this treatment: Michael S. Park & Patrick E. Elvander 2012, Lithophragma affine, in Jepson Flora Project (eds.) Jepson eFlora, http://ucjeps.berkeley.edu/eflora/eflora_display.php?tid=31236, accessed on April 22, 2019. KR, NCoRO, NCoRI, c SN, ScV (Sutter Buttes), n SnJV (Antioch), n CCo, SnFrB, SCoR, SCo (inland), s ChI, TR, PR; Markers link to CCH specimen records. Yellow markers indicate records that may provide evidence for eFlora range revision or may have georeferencing or identification issues. Purple markers indicate specimens collected from a garden, greenhouse, or other non-wild location.